When I was asked to give a product review for The Apprentice Doctor’s Suturing Course and Training kit, I readily agreed. As someone who provided oversight for nursing, surgical technology, medical assisting and veterinary technology programs, I was eager to see if the kit was something I could recommend for these kinds of programs. More importantly, since I primarily worked with under-resourced college students, discovering a way to maximize their time and limited resources while also improving their suturing skills was exciting. In today’s world, most students have full time jobs and families. When adding a full-time college load to their obligations, they often struggle with competing obligations. Everything has to get done, but checking everything off a daily to-do list is almost unmanageable. On days when more time is needed for work or family, eliminating a homework assignment or lecture is often the choice. The reality of time management is there really is no more time. The time-pie is already cut into the thinnest possible slices. Most students can read their textbooks and study their notes at home. But one thing they can’t do at home is practice their lab skills. Most college labs have set times when when they are open and staffed. When hours don’t coincide with students’ schedules, students lose premium individual attention and practice time. Having sufficient funds to cover transportation and additional childcare to return to campus outside of class is also challenging. For many it simply isn’t an option. They have to hope they can get by with what they learn during the lab time associated with the lectures. But without extra preparation, most students struggle gaining competency in suturing skills. But by having a suturing kit at home, students can be home with their families, and still practice their skills; at their convenience. The Apprentice Doctor’s Suturing Course and Kit is a great solution to one of the gaps in students’ educational experiences. When I got the kit, I dropped everything I was doing and opened it. I was surprised at the compactness of the packaging, but upon lifting the lid I realized that the size of the package had little in common with how much was inside. I could see right away it had everything students needed to master suturing. It even has a suturing practice skin with pre-cut wounds. One of the best parts of The Apprentice Doctor Suture Kit and Course is the ebook. It contains a lot of projects for practice that aren’t necessarily in any kind of medical curriculum. It presents different types of challenges that you’d see on the job. The practice skills allow students to do the projects multiple times until they feel confident. After reviewing the book and projects, I was convinced students would have plenty of creative projects to work with. Each case is clearly laid out with suturing solutions demonstrated through pictures, videos and text. All necessary tools are in the kit, allowing students to practice at their convenience. I believe a student who consistently practices with one of these kits will undoubtedly demonstrate better skills and more confidence than their counterparts. I wish all medical programs could offer such a kit to each student as part of their curriculum. There is a lot to like about The Apprentice Doctor’s Suturing Course and Kit. In general, I give it 4.5 stars our of 5, broken down in four general categories. Plenty of projects to practice your skills. Immediate access to course upon payment. Not the cheapest, but comes with a robust online course Online book is well organized and clear. Kit is complete. Reasonably prompt responses. FB support group. Twitter videos. Specifically here is what I like about the kit. Variety of tools It is the most expensive; however, there is a compact set that is less expensive. Online projects to enable proficiency. Doesn’t have the variety of suture thread sizes or number of sachets other kits have. Videos are included that demonstrate each technique in a step-by-step format so you can see each move. Students learn all the basic surgical knots and all 12 basic suturing techniques. Includes assessment module with qualified medical professionals as examiners and measurable outcomes so students can measure their skill levels. Posts suturing how-to videos on Twitter. This product is ideal for aspiring healthcare students where suturing is a part of their curriculum, or will be a part of their professional employment. Suturing itself is an art and requires dexterity and precision. The more students can practice the better they’ll be. If they have confidence in their ability to suture, when it comes time to interview for a job, they’ll be able to indicate that their skills are exceptional. Medical and paramedic students will also find this kit useful. The various projects insert students into situations they are likely to encounter. How to remove sutures (the correct technique). How to correctly line up wound margins. How to evert a wound’s edges when suturing and why that’s important. How to correct the “dog’s ear” suturing defect. How to avoid ugly scars. The best way to professionally care for wounds. 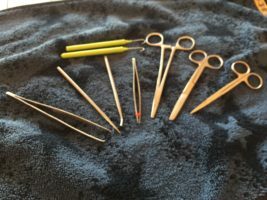 The correct techniques for holding your suturing instruments. How to treat wounds aseptically to minimize the chance of infection. The complications of suturing and how to prevent them. Students can gain in competency in the comfort of their own home by buying The Apprentice Suture and OnLine Training Program. Its contents provides suturing tools and materials students are apt to run across in school or in employment situations. Watch a student unpack the kit so you can see all the items inside. It comes with a CD course that can also be accessed on line. Being able to see how different sutures are done and then practice them with specific projects can give students an edge in school and on the job. Take a look at students working through projects. Verified buyer’s on Amazon have said the following about The Apprentice Doctor’s suturing kit. On TrustSpot, The Apprentice Doctor earned a 4.7/5 stars in 342 reviews. Reviews ranged from excellence in service to quality kits. What are the alternative suturing kits? There are other suturing kits available on the market, all of which are less expensive. However, only two others that I looked at provide some kind of ebook. Those that offer more pieces tend to count how many packets of threads are offered. So take care when shopping solely for the most “number of pieces” for a low price. The number of pieces doesn’t necessarily mean the kit has more instruments. They may only be providing extra packets of thread. There is one suture kit made by Nish that is the least expensive and may be tempting to buy. However, the kit caters to dental students, so would not be the best purchase for a medical or nursing student. 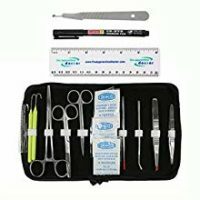 The Apprentice Doctor Suturing Kit and Training Course has a 30-day free return policy in addition to a 100% money-back guarantee on all unopened kits. They will even provide a 50% refund on returned used kits. The Apprentice Doctor® was also nominated as one of the “Top 10 Healthcare Simulation Solution Providers in 2018” by Healthcare Tech Outlook Magazine. The course is also internationally accredited by the International Association for Distance Learning (IADL). The Apprentice Doctor’s Suturing Course and Training Kit is designed to assist prospective medical and healthcare professionals to become proficient in suturing and learning the basic principles of wound care. Over 50,000 students have been trained using the methods provided in the course by Dr. Anton Scheepers who’s actively worked as a facial reconstructive surgeon for over 25 years.